We all have those times when were always hungry and eventually that shows up on our scale. That’s when I focus on getting rid of foods that do nothing to satisfy my cravings and load up on the good foods that keep me full and sane and maybe even help burn a few more calories. I also choose foods that have other benefits, not solely only for weight loss. 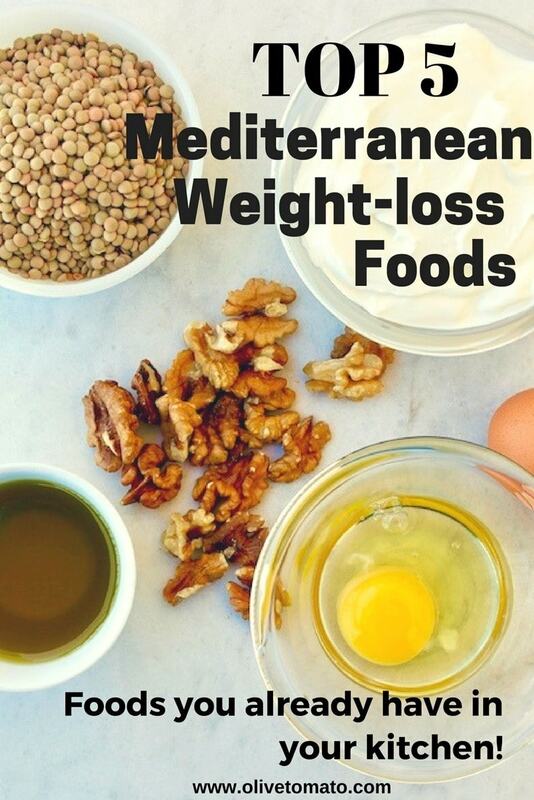 So here’s my go to list of of Mediterranean Diet weight loss foods that taste good and keep me satisfied throughout the day. The best part? They are not some obscure “superfoods”, but foods that you probably already have in your kitchen. I’ll tell you what they do and give some ideas on how to incorporate them in your diet. 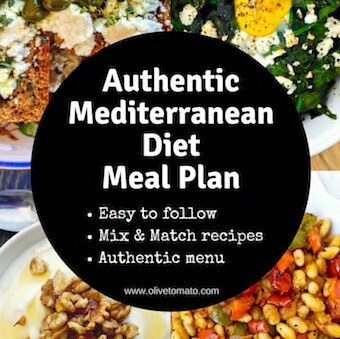 We know that one of the secrets of the Mediterranean diet is all the antioxidant rich olive oil that plays such a prominent role in this eating pattern. Apart from being good for the heart and the body in general, it is filling as many fats are. Olive oil is rich in the fatty acid oleic acid and studies have shown that it may prolong feelings of fullness between meals. Another study showed that individuals consuming an olive oil rich meal had a higher concentration of the satiety hormone serotonin in their blood. So, if you are trying to lose weight, don’t go the low-fat route. In your diet: Using olive oil judiciously will keep your appetite in check. Olive oil is the basis of Mediterranean and Greek cuisine. 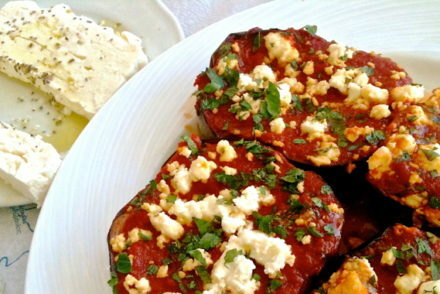 Almost every dish particularly vegetable dishes, are cooked in olive oil. Salads are always served with olive oil or an olive oil based dressing. Go here for more tips. Yogurt has played such an important role especially in the Greek-Mediterranean diet, hence the name. Greek yogurt is thicker and creamier than regular yogurt, which makes it a great snack. It also contains more protein, which will provide more satiety. Studies have also shown that getting more protein can help maintain muscle mass and burn more calories. In addition, dairy and calcium appear to play a positive role in weight loss. In your diet: Greek yogurt is usually enjoyed plain or with a bit of fruit or walnuts and a drizzle of honey. I choose full fat yogurt, more filling and rich. Eggs come on top every time. They taste good, they have few calories, are full of nutrients and are an important component of the Mediterranean diet as a non-meat source of protein. Studies have shown that eating eggs for breakfast (in the place of a starchy rich breakfast) can reduce calorie intake later in the day and result in weight loss. Also, don’t forget the protein, it keeps you full. In your diet: I like to pair eggs with as many vegetables I possibly can. So it could be an omelet with spinach or other veggies, or kagianas the Greek dish of scrambled eggs with tomatoes or just adding a tomato salad with a fried egg. Beans … the quintessential Mediterranean food. Beans are a great and a non-animal protein source. It’s the whole package: protein, carbs and fiber, the perfect combination for energy and weight loss. Of course they are associated with several health benefits apart from weight loos. A number of studies have shown that people who eat beans regularly lose more weight and faster. Also certain legumes such as lentils and peas contain the amino acid arginine that may play a role in our calorie and fat metabolism. 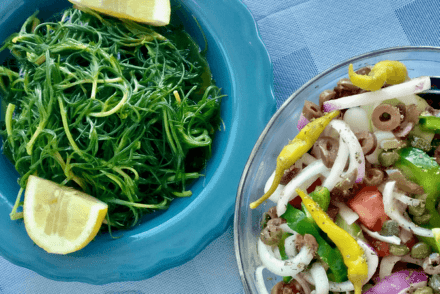 In your diet: The Greek and Mediterranean cuisine is rich in bean dishes: my favorite and easiest dish is Greek lentil stew other dishes include a you can also make a variety of bean salads and cooked meals such as roasted beans–gigantes plaki. 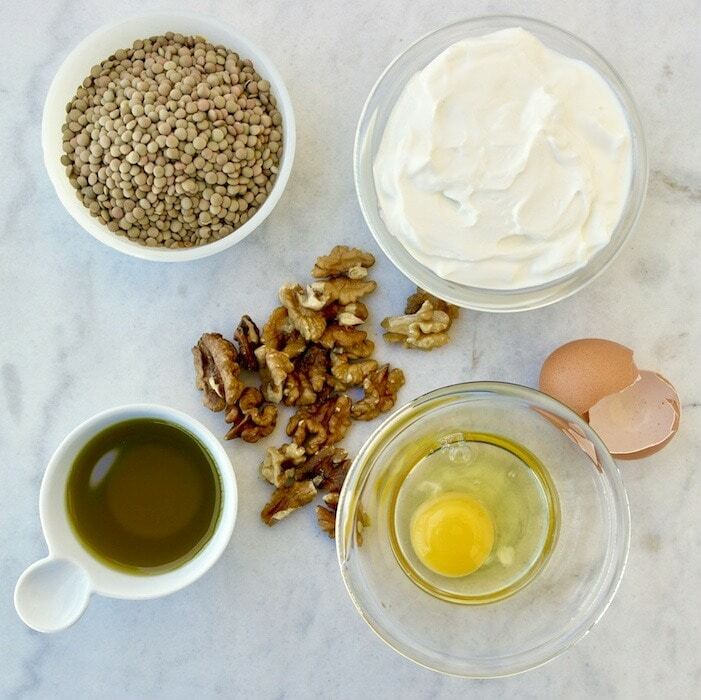 Walnuts are one of the healthiest nuts. The most important benefit is the fact that they are a good source of omega-3 fatty acids, in addition they are rich in protein and fiber and that makes them an ideal snack because they keep you full. Other benefits include protecting from diabetes, brain health, and are great source of antioxidants. In your diet: As a snack, add them to yogurt or oatmeal, in salads and with fruit. 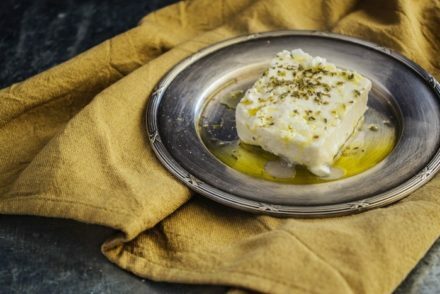 What’s the difference between the Mediterranean Diet and the Greek Diet? Nothing.